Jo McVeagh, is travelling New Zealand in a Greenpeace bio-fuel powered bus, indoctrinating high school pupils in "Climate Change" propaganda. Two of her companions, Kristin Gillies and Tia Taurere have alleged ties to the "Urewera 17", while Gillies was also active in the allegedly "terrorist" infiltrated Save Happy Valley Coalition. No less than six people accused by police of participating in "quasi-military" camps in the Ureweras, also have close ties to the SHVC. While not directly linked to the "Urewera 17", McVeagh has been a leading SHVC activist and has her own circle of radical friends. In 2003 McVeagh was active in the anarchist lead anti Genetic Engineering campaign. Jo McVeagh was spokesman for first group of 14 university student to enter Happy Valley on the West Coast at Easter 2004. That year McVeagh was on the executive of the national environmental federation, ECO and continued to organise Massey university's Environment Group, though she had left the university. McVeagh's main focus continued to be the Save Happy Valley campaign. She spoke at several public meetings on the issue and was spokesman for the Auckland University SHVC branch as late as 2006. McVeagh also supported other initiatives, most connected in some way to the Trotksyist leaning Socialist Worker organisation. In September 2005, while studying in Dunedin, McVeagh endorsed the Socialist Worker instigated Workers Charter Movement. why Kyoto just isn't good enough, the effects climate change will have on Aotearoa and the Pacific, what people can do to stop climate change, what is being done in Aotearoa to stop climate change. Ingrid Beckers an anarchist and organiser for the National Distribution Union, David Bedggood from the Communist Workers Group, Penny Bright, a former member of the Workers Communist League, Joe Carolan, from the Workers Charter Movement, Climaction and Socialist Worker, Mark Muller from the Maoist leaning, Workers Party, Mike Sousa, from the Dry River Collective, an anarchist group from Arizona, Mike Treen, formerly with the Socialist Action league, Communist League and the Alliance Party, Cameron Walker from Radical Youth and Omar Hamed from the same organisation. Omar Hamed was of course arrested in the "Urewera 17" anti terror raids. Ingrid Becker, David Bedggood, Joe Carolan and Cameron Walker have all been active in the "Urewera 17" support campaign of the last few weeks. In April 2007, McVeagh co-signed a Socialist Worker initiated letter condemning the alleged "Islamaphobia" of Investigate Magazine editor, Ian Wishart. 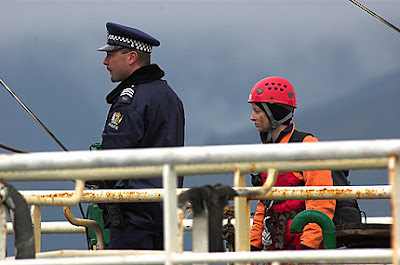 McVeagh has worked for Greenpeace since since February 2006, firstly as their Whales campaigner and recently with the Climate Team. a Chinese bottom trawler, Chang Xing in Port Nelson, stopping it leaving port. All three were arrested. Jo McVeagh is no moderate. Is she type of person Greenpeace should be using to "educate" schoolchildren. Hmmmmm... I'd say there's one or two "assumptions" in here, Trev. I'm also intrigued by your tendency to list all the other speakers at events a person contributes to, as if this implies something. You seem to believe that people only associate with people of similar political views, and that things can be assumed about people on the basis of who they spend time with. This isn't actually true, but I think you come from a time in which collectivist views and overarching ideologies were the norm, so perhaps its a bit of a generational thing? For example, I've sometimes spoken at events because I'm in agreement with fellow speakers, but the converse is also true - sometimes I would want to speak because I disagree with the other speakers, to offer a different perspective.